We have about 15 maple trees on the hill above our house, and I spent most of the autumn cleaning up their leaves. I noticed that the gutters were particularly good at catching and decomposing leaves, and began to wonder if I couldn’t do this on a larger scale. At the same time, I was considering what to do about a sad patch of ground at the bottom edge of the property where the downhill neighbors had installed a small culvert to divert our runoff. If I had a large gutter full of leaves there, I could catch the runoff and decompose the leaves at the same time, improving the soil with minimal effort. It was then that I remembered my history of technology, specifically the fish weirs that hunter-gatherers used to catch fish. We did a lot of brush clearing this year, and I have stacks of wood that is still too green for the fireplace. So, I drove a row of stakes into the ground and wove branches between them to form a weir for leaves. Then I dug a trench or swale uphill from the weir and began adding leaves. 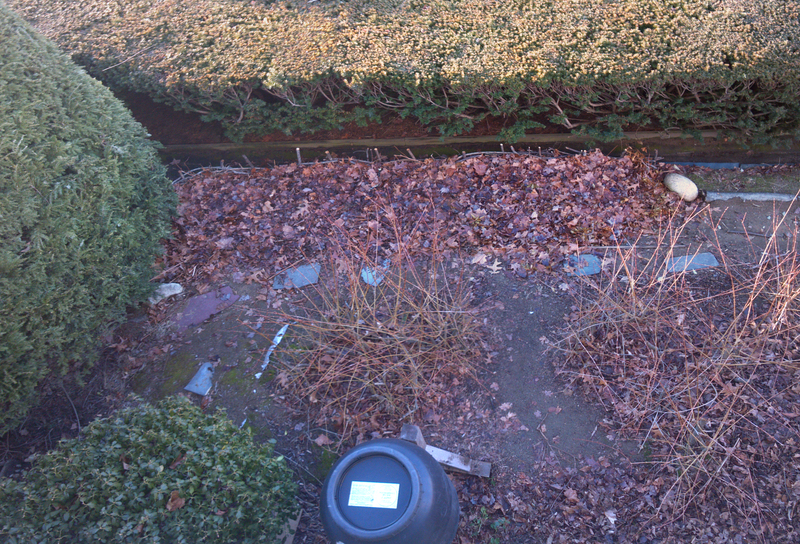 The leaf weir viewed from above, filled with leaves. The granite stone at top right was a gift of the last glacier in these parts, by way of good friends from work. To date the leaf weir has consumed over 20 barrels of leaves. Being in a depression and behind a hedge, the leaves don’t blow away easily. 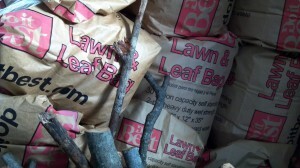 I continue to pile more leaves on top, and it continues to digest. In addition to eating leaves, it drinks copious amounts of water. 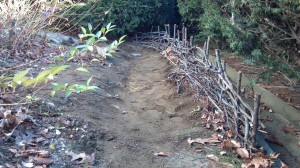 The whole thing took a morning to build with just a few hand tools, and will continue to improve the soil for years. All new entries are spot on. Where did you find the photo of the great lakes giving off steam?